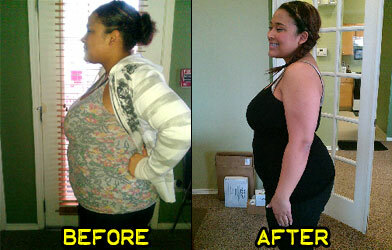 Pounds or Inches Lost: I have lost a total of 33 pounds! I’ve been unhappy with my weight for years. When I had my daughter 6 years ago I lost complete control. I decided to lose weight because I was so unhappy. I was depressed and sad all the time. I turned to alcohol, drugs and food to solve my problems. I would walk from the kitchen to the living room and be out of breath. I was about to start wearing size 22. My face had gained so much weight I didn’t even recognize the person in the mirror. I was making horrible decisions because I was so unhappy. I watched a documentary called “Fat, Sick and Nearly Dead,” and I have to say it changed my life forever. I wanted to be happy and love myself for a change. It was time I taught myself to be healthy and happy. I decided to start eating only fruits, veggies, chicken and other foods that were high in fiber about 5 times a day. I didn’t cut myself off completely though. My family has big Sunday dinners every week with lots of food. I would eat small portions and only one plate instead of going back for seconds. I didn’t want to lose the weight fast. I did allow myself to indulge once a week. I did a lot of workout using exercise DVDs and Zumba. I worked out for 30 minutes in the morning and 30 minutes after work. I joined a gym with my coworker and that really helped a lot to have someone there to push me. Most of my friends and family are smaller, so they didn’t understand where I was at or coming from. I had to learn to stay strong and retrain myself. When friends wanted a midnight snack of fried chicken, I stayed strong by eating my veggies. 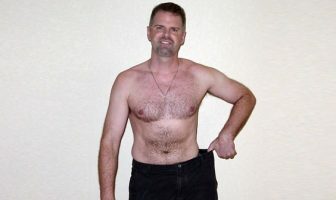 The first 3 weeks I lost 20 pounds. After 5 weeks everyone else starting noticing. I was able to wear things I hadn’t worn in years. I used to wear a girdle to make my curves smooth. After a month, I noticed I didn’t need it as much anymore. It has taken 5 months to reach my goal. It hasn’t been easy. I have my days where I indulge too much, or skip the gym. But I’ve worked hard to get to where I am and I will NEVER go back to where I was. It has only been 6 months since making my lifestyle change but its the longest I’ve ever gone. Usually I stop after the first month. 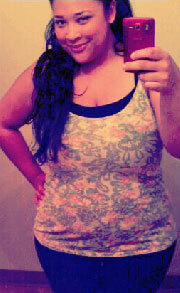 I look at before pictures and I look in the mirror. I remind myself why I started this journey and how I have come too far to throw this away now. I look in the mirror and I am happy with what I see. I am more confident, and not as shy. I know that I can set goals and accomplish them. I know that I am way stronger than I ever thought. The best thing is knowing I’m not a quitter and that I can achieve what I set my mind to. Reading all the weight loss stories on ShapeFit.com helped keep me going. Instead of eating when I had a craving, I would read what people did to stop themselves. I would also research different healthy recipes so I didn’t get bored. Retrain your taste buds to crave fruits and veggies. Seasonings are your best friend. Support from the people closest to you is the key. A little bit of physical activity is better than nothing. 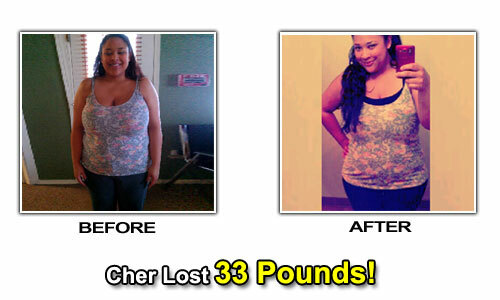 Cher’s Weight Loss Eating Plan! 1 apple, 1 cucumber, 3 celery sticks cut up with lime juice and fruit. Grilled chicken breast with BBQ sauce on the side, 1 cup of veggies and a cheese stick. Soup or salad with lots of veggies and fruit. Spinach is my favorite with salt and non-fat butter spray. I use exercise DVDs for weight training. I use exercise DVDs and Zumba for cardio.